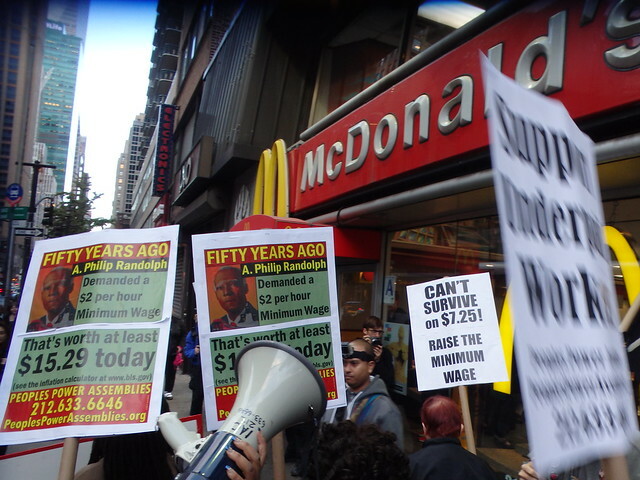 NYC Rally to Raise the Minimum Wage. A procession of 138 mock coffins to the Texas State Capitol to represent construction workers deaths. Black Friday protests and walkouts at Walmart. Fast food workers and supporters marching for the Fight for 15, a movement to push the minimum wage toward a living wage. These are some of the worker-led, collective actions being organized in Texas and across the country to protect workers in our 21st century economy. They’re not creating tension, their exposing it. In the US, we don’t always center economic issues around race, but our history demands that we do. The creation of value in our economy has always been racialized. Property ownership in American history is both the story of who is bought and sold as much as what is bought and sold. Political and economic systems have failed to provide people of color with the same range of economic opportunities afforded to white Americans. In terms of wealth building and wealth transfers, there is a huge gulf between whites and people of color. We cannot fully understand what it means to be a property owner without acknowledging how inequality and race affect our purchasing power and our ability to build and retain assets. At the core of these issues is a hard truth: low-wage jobs employ a disproportionate number of people of color and women. And many of these jobs, in which people of color are overrepresented, are dangerous. Forty percent of tipped workers—who make an average hourly wage of $2.13—are people of color. A Restaurant Opportunities Centers (ROC) study found 58% of workers with incomes below the poverty line, and over 50% of tipped workers and restaurant workers with incomes below the poverty line are people of color. A Facing Race panel titled “Hard Labor: Inside the New Movement for a Higher Minimum Wage and the Freedom to Unionize” gave first hand perspectives on recent efforts among low-wage workers to organize and strike for better labor and employment. The challenge in this new economy: How do we make employers responsible for working conditions in their firms? Addressing this challenge, without a doubt, starts with a living wage. Dorian Warren of the Roosevelt Institute at Columbia University described how every minimum wage ballot initiative since 2000, even in places like Arkansas, Nebraska, and South Dakota, have passed, drawing support from across the political aisle. If voters aren’t in favor of an increased minimum wage, they certainly haven’t shown it. These small wins are huge for low-wage workers. Yet, as Warren described on the panel, there has also been a deliberate “decoupling” of these minimum wage ballot initiatives from the larger narrative about what is happening to low-wage workers in this economy. Reconnecting the two is critical to understanding the links between racial justice, poverty, and raising the minimum wage. Colby Harris and Patricia Cruz, both low-wage workers, shared insights from their work with the Our Walmart and Fight for 15 Campaigns. Both have walked off the job and faced the fear of not being hired back. What do these workers want? As Colby described to the New York Times, “We’re protesting because we want better working conditions and better wages and because we want them to stop retaliating against associates who exercise their right to talk about what’s going on in their stores.” Their demands are basic: these workers want $15 an hour and 40 hours a week. They also want more power in scheduling their hours—power that is essential for those caring for families, working multiple jobs, and seeking education. How does this interact with urban planning and what can planners do? Those of us working in economic development, must be able to analyze the elements, interactions, and consequences of racial meaning in our economy. We must move beyond reductive analysis and think in terms of systems: what kind of economic development are we encouraging? What kinds of jobs are we helping to create? People who earn more, spend more. It’s an economic stimulus. If the federal minimum wage was raised to $10.10, three and a half million people would be lifted out of poverty. Understanding and rethinking the relationship between work, race, and economic growth is key to building shared prosperity. This post is part of a series by three students from MIT’s Department of Urban Studies and Planning, reflecting on the racial justice movement building lessons they took away from last week’s Facing Race 2014, a National conference organized by Race Forward.